with numbers in more than 100 countries & guaranteed quality. Our international conference call service works with any phone to connect people from around the world together on the same conference call. 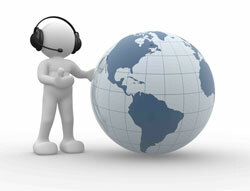 OnConference has access phone numbers located in more than 100 countries across the globe. Your call is backed up by great support and our 100% guarantee that everything will work to your satisfaction. Prices are per line per minute. To hold a call, everyone dials an access phone number and enters the 7-digit access code. Anyone who dials any access phone number and who uses the same access code is connected to the same conference call -- our global network links all the participants. You get your own dedicated 7-digit access code and passcode when you sign up for our service. It takes about 30 seconds and you can start conferencing immediately. The best and easiest way to join an international conference call is to call a toll free access phone number. However, toll free numbers usually don’t work across country borders. To solve this, we have toll free numbers in more than 100 countries. 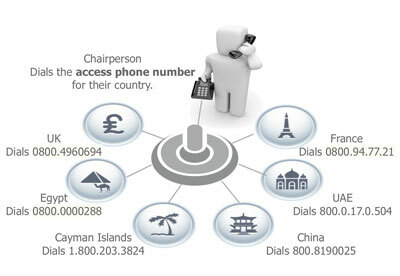 Additionally, for countries where we don’t have a toll free number, people can call our direct dial access number. Everyone can dial a toll free number for their own country. Everyone will be connected together. Support is always available for your international conference call – no matter where you are located – 7 days a week, 24 hours a day -- just hit *0 during your call and an operator will help you. In addition, we have toll-free support numbers in 52 countries. Alternatively, can call +1.514.282.4047 to get support from anywhere in the world. OnConference uses one of the largest global conferencing infrastructures in the world. That means you have clear conference calls - in your country and around the world. We guarantee the audio quality of your international conference call. There will be no echo or fading, speech will not be choppy and the voice delay will be minimal, no matter where you are in the world. Learn more about our guarantee. You receive a detailed invoice each month showing all your conferences, the country of the caller, and the duration they were connected. You are billed based on the country your conference participant is calling from and the number of minutes used. Get the USA, Canada and 20 other countries for the same price -- just 19 cents per minute per line. All pricing is per minute per line and includes toll-free access and conferencing charges. There are no monthly contracts, extra fees, or obligations. You only pay when you use the service. People using the toll numbers may incur long distance charges and are responsible for those themselves. Some countries have both a toll and toll free access number, and many countries have a toll free number for support. Some toll free number have restrictions (for example, not accessible from a mobile phone). We do our best to identify these below. If there is a restriction on the toll-free number, the toll number can often be used instead. Support from any country +1.514.282.4047. Support during a conference call: press *0 (private) 00 (public). *Restrictions: Some toll-free numbers are not accessible from mobile phones, pay phones, certain locations or telephone networks. Anyone can use the direct dial access phone number (+1.416.620.1296) to reach a conference call or any chairperson can dial-out to a participant using *1 with the US & Canada. International dial-out is available upon request and requires 24 hours for approval and activation. a No toll-free access from mobile phones. b No toll-free access from pay phones. Greece Access only from OTE Globe network. India No access from: BSNL - mobile, MTNL- Mobile, S-Tel Mobile, Videocon Mobile, HFCL Infotel/Ping Mobile, TTSL (Prepaid), Etisalat DB Telecom, and Uninor networks. Indonesia No access from PT Telkom network. Participants must activate International Direct Dialing (IDD) capability with their local carrier to access toll free numbers from fixed lines. Mobile phone access only from Matrix Cellular. Japan Mobile phone access requires registering with KDDI. Macau Access is dependant on local provider capacity. Moldova Mobile phone access only guaranteed from Moldtelecom network. Philippines Access only from PLDT landline phones. Mobile phone access only from: Sun Cellular & Smart/Piltel networks. Russia Access only from: Rostelecom, Aerocom, Gaztelecom, Global One, RusTelNet, Incom, TCM, Astelit and ASVT networks. Saudi Arabia Access only from: STC fixed and mobile networks, but not from Mobily and Zain mobile networks. Serbia Access only from: Telekom Srbija A.D. fixed network and MTS Networks (Mobile). Taiwan Mobile phone access from KG Telecom only. United Arab Emirates Mobile phone access only from Etisalat Network. Uruguay Mobile phone access only from providers Ancel and Movistar. France Restricted to mainland France & Corsica. No access from Reunion, Martinique, Guadeloupe, Guyane, St. Pierre-&-Miquelon, Mayotte, New Caledonia, French Polynesia, Wallis & Futuna. Israel No access from Palestine territories. Russia Access only from: Astrakhan, Barnaul, Birobidjan, Blagoveshchensk, Bryansk, Cheboksary, Chelyabinsk, Cherepovets, Chita, Ekaterinburg, Gorno-Altaysk, Irkutsk, Kaluga, Kazan, Kemerovo, Khanty-Mansijsk, Kostroma, Kurgan, Makhachkala (Dagestan), Maykop, Moscow (Rostelecom), Murmansk, Nalchik, Nizhni Novgorod, Novgorod, Novosibirsk, Omsk, Orenburg, Penza, Perm, Petrozavodsk, Pskov, Rostov on Don, Salekhard, Samara, Saransk, St.Petersburg, Stavropol, Syktyvkar, Tomsk, Tver, Ufa (Bashkorkostan Republic), Ulan-Ude, Ulyanovsk, Vladicavkaz, Vladivostok and Primorskiy Area, Volgograd, Vologda, Voronezh, Yakutsk, Yoshkar-Ola, Yuzhno-Sakhalinsk. UK Access from England, Guernsey, Isle of Man, Northern Ireland, Scotland, Wales, and the Channel Islands. "We’ve used onConference for several months for calls within the UK and with our US clients, and have found it to be excellent. Put simply: it works, is simple to use, and does everything you need it to. Exactly what you want from a conference service." We looked at other companies on the internet. See how we are different than the others. "Our experience with onConference has been overwhelmingly positive. We needed a flexible environment that could handle our widely distributed group, and onConference has provided a great framework. The non-North American toll free numbers have made the service work for us. Support is easy to access and helpful."